Eggs past use by date, cook it or throw it? Don't be fooled by the use by dates and best before dates on food products. These are just a guideline as supermarkets and food producers have to cover their own backs. If you're not sure about whether a food product is fit for consumption a simple search on the internet will provide some answers and often give you a means to test the food in question. For example, I was just about to make some Yorkshire puddings to go with my Sunday roast and realised I only had one egg left in the fridge. When I looked at the date of the egg it was 2 weeks after its best before date. However, as it was a Sunday, and all the shops were shut, and I couldn't really leave the house as I was in the middle of cooking dinner, I decided to do some quick research and found some good tests you can do on eggs to see if they are safe to use after their best before dates. 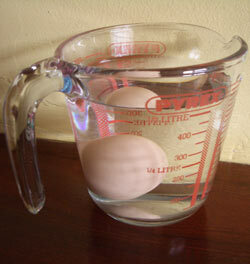 The test I did was to submerge the egg in a jug of cold water and if the egg sunk to the bottom it was fresh. However if it floated to the top it was rotten. Every egg has a little air pocket and the older the egg the bigger the air pocket becomes and therefore the egg will float. As you can see in the photo my egg sank to the bottom of the jug. So we will have Yorkshire puddings with our dinner tonight! Another test that I've used in the past is to examine the yolk. If the yolk is quite firm and raised then the egg is quite fresh, however, if the egg is old the yolk will be flat and have a tendency to break easily. In my search I also stumbled across a great poem which would be worth remembering. On a last note, if you are using an egg after it's best before date it's probably a good idea to use it for cooking rather than in its raw state, for example, like making mayonnaise. If you're not sure then don't take any chances and chuck it! Oh, and don't forget to put your egg shells in your compost bin! Can you eat that egg? If not sure you ought-ter, then place it in water. If it lies on its side, then it's fresh; eat with pride. After three or four days, at an angle it lays. But, it still is a treat, so go on and eat. Ten days, stands on end, in your baking 'twill blend. 'Cause it's definitely edible, in your baking, incredible. But, if it floats on the surface, that egg serves no purpose. 'Cause a floater's a stinker! Out the back door best fling 'er!